It could address concerns behind animal consumption, scientists say. Watch the full HuffPost Live conversation about in-vitro meat here. Dr. Mark Post, a researcher at Maastricht University in the Netherlands, served up a lab-grown hamburger patty for taste testing at an event in London in 2013. Now, the price of that patty has been scaled back from $325,000 to a much-more-affordable $11, Post told HuffPost Live. 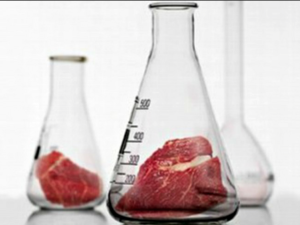 He added that his research could have serious environmental and ethical applications, as it suggests that lab-grown meat could replace animal consumption. Carolyn Mattick, a fellow with the American Association for Advancement of Science, told HuffPost Live that in-vitro meat production would require just one-sixteenth of the land that current beef production uses, but she warned that researchers would have to use large quantities of energy to cultivate the meat.